Back row Iain Henderson has been awarded his first full contract with Ulster after impressing coaching staff with his recent performances. 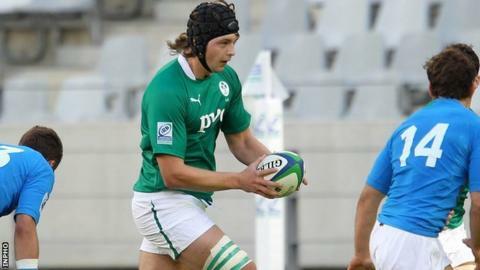 The former Ireland Under-20 international has been upgraded from a development contract and will stay with the Irish province until June 2015. Henderson has progressed through the Ulster Academy system and has played in two IRB Junior World Championships. He was one of the standout players in this year's tournament in South Africa. The 20-year-old made his senior debut for Ulster as a substitute in the Pro12 defeat by Connacht in April this year. The following month he marked his first start with a fine individual try against Munster at Thomond Park, a score which followed an explosive run down the touchline. His third appearance came in the recent 48-19 win over Cardiff at the Arms Park, in which he played a huge role. "I've dreamed of being a professional with my home province and it's fantastic that it's come to fruition," said Henderson. "I've learnt a great deal from the coaching staff and senior players here and I can't wait to continue my development at Ravenhill - there's a lot of competition in the squad, particularly in the back row, but I want to try and get as many games as possible under my belt." Ulster Director of Rugby David Humphreys described Henderson as "one of the brightest young players in Ireland". "He has all the attributes required to be a top class forward and we are delighted to welcome him into the professional set-up. "We are trying to build a team of homegrown players which is capable of competing with and beating the best teams in Europe, and Iain epitomises what we are trying to achieve. "His performance against Cardiff a couple of weeks ago underlined his massive potential, but also showed that he is able to play at this level now. The exciting thing for us is that he will only get better."